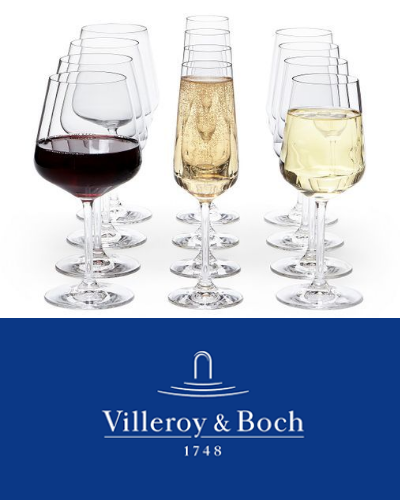 Free Villeroy & Boch Crystal Glass Set! Order Now! Free Villeroy & Boch Crystal Glass Set! Due to popular demand, we are extending this spectacular free gift offer. For orders over a certain value, you will receive a free Villeroy & Boch Crystal Glass set! These have been hugely popular with our customers, you might be adding to your existing Villeroy and Boch glassware collection, or new to the V&B brand, but either way these crystal glasses will add the touch of glamour to your dining table. Every household needs to have a decent set of wine glasses! but also receive a little something extra from us to adorn your home on orders over £500. this includes 4 x Red wine goblets, 4 x White wine goblets and 4 x Champagne flutes. The offer is limited, so don’t miss out –place your order now! If the order is more than £500 (excluding delivery fee), the customer will receive a free V&B Entrée crystal glass set. Transit damage to promotional items is not covered, there are no replacements offered for damaged promotional items. We do not accept returns on promotional items. Only applies to an order made online. The offer does not extend to quotes or price matches.